When I was a kid my did would warn me to watch out for the man eating plants when we'd visit. Advertisement for the Grand Opening of my Family's Dime Store on 103rd Street. I'm guessing this was mid 1950s. The ad is undated and I'd have to dig through papers to find the date it opened. 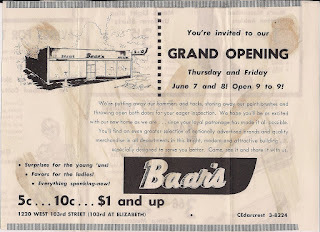 It replaced an earlier store on the same block my Grandfather opened in 1943. This is the Army training film featuring Sargent Harold Russell. Billy Wilder saw and it prompted him to cast Russell in the film "The Best Years of Our Lives". Veterans welcome? Less than 2 percent of Capitol Hill staffers have military experience: Veteran representation on congressional staff trails far behind other federal agencies.